Bogue's Restaurant is a diner-style restaurant located in the former Birmingham Fire Station No. 22 at the corner of Clairmont Avenue and 32nd Street South in Lakeview. The restaurant was founded in 1938 by Pat and Mildred Bogue. They grew it into a formidable businessman's destination, best known for its breakfast with sweet rolls and its vegetable plates at lunch. 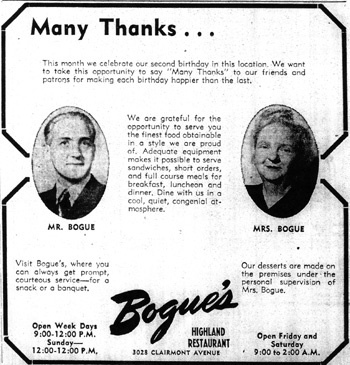 In 1946 the restaurant moved to 3028 Clairmont Avenue and was briefly called Bogue's Highland Restaurant. A 1948 advertisement  featured portraits of the proprietors and promised that Mrs Bogue personally supervised the preparation of all the desserts on premises. Andy Straynar, a veteran of Britling Cafeteria, partnered with Charlie Lawrence and another investor to purchase the restaurant from the Bogue's in 1968. Sometime in the mid-1970s they replaced the tables and chairs with orange-vinyl booths and added a wrought-iron railing to the front. Straynar bought out his partners and ran the business himself until he retired on April 1, 2000, turning the restaurant over to his son, Greg. Greg Straynar struggled to maintain profitability and sold the restaurant to Daryl Whitfield, who formed Rostro, Inc. to operate the business, in 2006. The building in which the restaurant operates was leased from Curt Ruttle and Maria Hontzas Ruttle of Arizona. A second location, called Bogue's Homewood Diner, opened at 162 Oxmoor Road in West Homewood in August 7, 2007. Another location, on U.S. Highway 280, followed in 2009. In April 2010 a $6 million proposal was made by Connolly Net Lease of Lawrenceville, Georgia to demolish Bogue's, a neighboring service station, and Birmingham Fire Station No. 22 to construct a 14,250 square-foot Walgreen's pharmacy with a 62-car parking lot and drive-through window. In September of that year, Connolly confirmed that they would be able to renovate the fire station for Bogue's and the Platinum Salon. Bogue's moved to the new space in February 2012. Meanwhile in May 2010, Whitfield received a notice from the city of Birmingham requesting payment of $129,852 in unpaid sales taxes from the period between January 2006 and February 2010. Whitfield disputed the amount, stating that some of the unpaid taxes were from the period before he took ownership. In February 2011, the city reported Whitfield's total unpaid sales and occupational taxes and license fees had climbed to $157,271. A February 17 hearing was set in Judge Houston Brown's court and a settlement was reached for the restaurant to make regular payments. Meanwhile in May 2013 Jefferson County won a $92,170 judgment against Bogue's for delinquent sales taxes, penalties and interest dating to 2007. Under a settlement agreement the restaurant was to make monthly payments of $5,000 to the county. When the county failed to collect, it filed a lawsuit in June 2014, claiming it was owed a total of $167,360. In December of that year, Business Insider magazine named Bogue's the best diner in Alabama. Whitfield's Rostro, Inc. filed for Chapter 11 bankruptcy protection in March 2015. He expected the reorganization to have no effect on ownership or operations. This page was last modified on 6 March 2015, at 10:12.